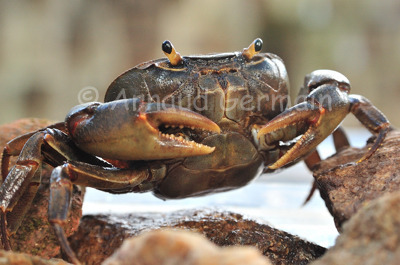 arnaud germain wildlife photography: Land Crab in Lilongwe! Yes, I know a land crab is not an insect, it is a crustacean. But I did not want to create a new section just for him! I was watching TV at home, in Lilongwe, Malawi, when this land crab came wandering on the carpet in the lounge. The thing is: we were living miles away from any watercourse. I captured it, took pictures with my 105mm macro lens, and went to release it in the river in Lilongwe Wildlife Centre.